(Reuters) - High-profile U.S. elections in Georgia, Florida and Arizona remained unresolved on Thursday, two days after the vote, with the prospect of legal challenges, recounts and ballot reviews setting the stage for possible weeks of uncertainty. In Georgia, where Republican Brian Kemp declared victory in the governor's contest on Wednesday on a narrow lead, campaign officials for Democrat Stacey Abrams on Thursday vowed to pursue litigation to ensure all votes are counted. In Florida's U.S. Senate race, a lawyer for Democratic incumbent Bill Nelson said a recount could still deliver him a victory despite a slim lead for Republican Rick Scott. The hotly contested U.S. Senate race in Arizona between two congresswomen, Democrat Kyrsten Sinema and Republican Martha McSally, appeared days away from a final call, with hundreds of thousands of ballots yet to be tallied and McSally holding a small edge. Democrats on Tuesday won their first majority in the U.S. House of Representatives since 2010, while Republicans appeared likely to expand their two-seat advantage in the U.S. Senate. Another cluster of races in the lower house where votes are still being finalized could add to the Democrats' new majority, strengthening their hand as they seek to counter Trump's policies. Democrats also picked up two Republican districts in Washington State and New Mexico on Wednesday night, though Republicans held onto an open North Carolina district in a close race. 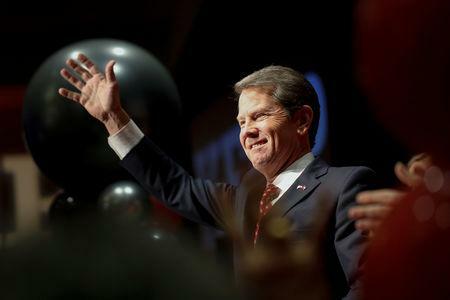 The Georgia contest came under national scrutiny because of Kemp's role as the state's top election official. Voting rights groups and prominent Democrats accused the Republican of using his position to suppress minority votes, an allegation he strongly denied. Kemp's vote count stood at 50.33 percent as of Thursday morning, according to unofficial results. "We are in this race until we are convinced that every vote is counted," the Abrams campaign's chairwoman, Allegra Lawrence Hardy, told a news conference. The campaign said it would file the first of what could be a wave of legal actions on behalf of voters in one county who had difficulty voting absentee. The Kemp campaign accused Abrams of trying to "steal" the election. "Stacey Abrams can't accept the fact that Georgians rejected her radical agenda at the ballot box, so now she's desperately trying to steal this election in the courtroom," said campaign spokesman Ryan Mahoney, in a statement. In Florida, Scott's lead was narrowing on Thursday. Nelson trailed by around 17,300 votes, or 0.21 percent, below the state's 0.25 threshold for a hand recount. "The results are unknown," said Marc Elias, an attorney for Nelson's campaign. Historically, Democrats tend to pick up votes in recounts, especially hand recounts, he said. Scott's campaign on Thursday also accused Nelson of trying to "steal" the race. "It is sad and embarrassing that Bill Nelson would resort to these low tactics," a campaign statement said. In the Florida governor's race, DeSantis' lead had winnowed to about 38,500 votes on Thursday afternoon, or 0.47 percent of the vote. The state conducts an electronic recount when the margin falls below 0.5 percent. Gillum's campaign said it was prepared for any outcome, including a recount. "We want every vote counted," Gillum said in a video posted to Facebook on Thursday. "In spite of the fact that we're a little bit down in the numbers, we're hopeful that every single vote will be counted in this race."